Many kids struggle with the separation of a parent or other family member due to active military duty. Monique and Alexa Peters brought Cooper and his friend Trooper to the rescue in wading through this difficult time. The story helps open up conversation for kids who might be hurting and gives them some ideas to put their worries to work. The story is cute, but my favorite part comes after the story. The authors broaden the application to include dealing with any type of separation. 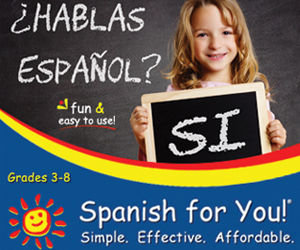 Talking points can give you the springboard you need to encourage your child in this area. The end of the book also includes some questions to recap the story and the lessons taught through it. Kids will also find a fill in the blank letter they can use to begin their own letter of thanks to service men or women along with a website to look for more information on encouraging our troops. **Please note this copy for review DOES NOT have the FINAL cover, but the winner giveaway copy will. Not just do I get to share a review of this helpful book, I also get to give a copy away to one of my readers. If you would like to enter to win a copy of this book, please leave a comment with this post. Make sure to leave an email that I can reach you at to let you know if you have won! The drawing will go through next Friday night, February 17. You can earn additional entries by sharing about this giveaway on facebook or other online networks and then come back and leave another comment saying you did so. The CD starts with the familiar ding of the key in the ignition. The engine roars to life and we are off. Get in, I’m driving . . .
Soulful, bluesy, hard to nail down. Ginny Owens. A beautiful voice, great to pop in when you need to unwind. She has some more upbeat songs, but I loved the soothing sound of her music. Of course, if my kids had to pick, they would say they loved the songs with the drums calling out as they danced around the room. Something for everyone, I suppose. Many of the songs draw on the sound of the keyboard and her voice. Highlighting the words and the music, not the rhythm and background instruments. Lovely, pure music. Eleven songs, each unique and enjoyable. You can find hes brand-spankin’ new CD in stores and online starting today and it would be a great addition to any CD collection. And, a GIVEAWAY!!! If you would like to win a copy of the CD for your very own, please leave a comment with you name and email address so I can get in touch with you if you win. You can get additional entries by following this site, or sharing about this contest elsewhere (blog, facebook, twitter, etc.) Just come back and comment for each of those items that you do. Contest will run through this week and close on Saturday in the evening. Can’t wait to get this into your hands. “Guides Concerning the Use of Endorsements and Testimonials in Advertising. If you would like to win one of these books (a new copy, straight from the publisher) for a preschooler you love, head over to Delighting In His Richness to enter. Contest is only open until next Tuesday, so check it out soon! Got some curriculum you would like to bless another homeschool family with? Would you like to win some gently used, new-to-you homeschool books? Then, I have found the bl0g event for you . 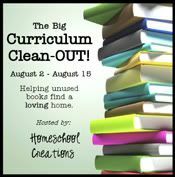 . .
Jolanthe, over at Homeschool Creations (a fellow CREW member), is hosting a Curriculum Cleanout Giveaway the beginning of August. Read her site for all the details, but basically she is asking homeschoolers to look through their shelves and come up with a new or gently used item to give away the first couple weeks of August (the second through fifteenth). You can post about it on your blog or just leave a comment with an email address for people to enter to win your giveaway. You are responsible for shipping costs on any books you give away. Any one can enter to win, so be sure to check out her site in a couple weeks and see if someone might be giving away something you have been wanting to own. You just might get it for free! Head on over and check it out. Get your goodies together to giveaway, and get ready for entering some drawings for homeschool books and curriculum.